The back-up series from the well-known Exit Stage Left: The Snagglepuss Chronicles comic has broken out on its own now. The Sasquatch Detective full-color one-shot was written by Brandee Stilwell with art by Ron Randall and Gus Vazquez. “Before Tonya Lightfoot became Los Angeles’ most decorated detective, she was a wee sasquatch roaming the Appalachian mountains, fed a steady diet of tennis and golf (as both of her parents are pros at the local country club) and CSI episodes. But her idyllic life of pranking campers and squatching around the local golf course hits a bump in the fire road when Bigfoot hunters come to the dense forest. Would Tonya back down in the face of adversity? Not yeti! But experiencing this abominable anti-sasquatch sentiment gives her the determination to leave her home behind-she heads to the dangers of the city. 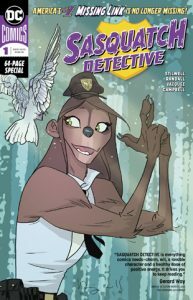 After all, it’s hard to fight un-conscious bias, but crime is something America’s sassiest sasquatch is ready to tackle.” The one-shot features the original Snagglepuss material plus a whole new story. Look for it on the shelves.